This article is about the metropolitan borough. For the municipal borough, designated a city in 1897, see Bradford. For other uses, see Bradford (disambiguation). The City of Bradford (/ˈbrædfərd/ ( listen)) is a local government district of West Yorkshire, England, with the status of a city and metropolitan borough. It is named after its largest settlement, Bradford, but covers a far larger area which includes the towns of Keighley, Shipley, Bingley, Ilkley, Haworth, Silsden and Denholme. Bradford has a population of 528,155, making it the fourth-most populous metropolitan district and the sixth-most populous local authority district in England. It forms part of the West Yorkshire Urban Area conurbation which in 2011 had a population of 1,777,934, and the city is part of the Leeds-Bradford Larger Urban Zone (LUZ), which, with a population of 2,393,300, is the fourth largest in the United Kingdom after London, Birmingham and Manchester. The city is situated on the edge of the Pennines, and is bounded to the east by the City of Leeds, the south east by the Metropolitan Borough of Kirklees and the south west by the Metropolitan Borough of Calderdale. The Pendle borough of Lancashire lies to the west, whilst the Craven and Harrogate boroughs of North Yorkshire lie to the north west and north east of the city. Bradford is the 4th largest metropolitan district in the country, and the contiguous urban area to the north which includes the towns of Shipley and Bingley is heavily populated. The spa town of Ilkley lies further north, whilst the town of Keighley lies to the west. Roughly two thirds of the district is rural, with an environment varying from moorlands in the north and west, to valleys and floodplains formed by the river systems that flow throughout the district. More than half of Bradford's land is green open space, stretching over part of the Airedale and Wharfedale Valleys, across the hills and the Pennine moorland between. The Yorkshire Dales and the Peak District are both in close proximity. Bradford has experienced significant levels of immigration throughout the 19th and 20th centuries. In the 1840s Bradford's population was significantly increased by migrants from Ireland, particularly rural Mayo and Sligo, and by 1851 around 18,000 people of Irish origin resided in the town, representing around 10% of the population, the largest proportion in Yorkshire. Around the same time there was also an influx of German Jewish migrants to the town, and by 1910 around 1,500 people of German origin resided in the city. In the 1950s there was large scale immigration from South Asia and to a lesser extent from Poland. Bradford has the second highest proportion in England and Wales outside London, in terms of population (behind Birmingham) and in percentage (behind Slough, Leicester, Luton and Blackburn with Darwen). An estimated 140,149 people of South Asian origin reside in the city, representing around 26.83% of the city's population. An estimated 352,317 of all White ethnic groups reside in the city which includes people of Polish and Irish origin, representing around 67.44% of the city's population. On the morning of 1 July 1916, an estimated 1,394 young men from Bradford and District The Bradford Pals, the 16th and 18th Battalions of the Prince of Wales Own West Yorkshire Regiment left their trenches in Northern France to advance across No Man's Land. It was the first hour of the first day of the Battle of the Somme. Of the estimated 1,394 men who left the trenches 1,094 were either killed or injured during the ill-fated attack on the village of Serre. The National Science and Media Museum (formerly the National Museum of Photography, Film and Television) was established in the city in 1983. One of the first cinema shows outside London took place on the site where the museum now stands, in a music hall known as the People's Palace. Today, the National Science and Media Museum hosts the annual Widescreen Weekend film festival. Bradford became the world's first UNESCO City of Film in 2009. The cinema connections in the city (which is also the home of the National Science and Media Museum) are both historical and contemporary, with ongoing efforts to preserve, promote and enrich the city's heritage of film. Bradford has been a film location since the beginning of cinema, with its indigenous film industry being traced back to the years around the First World War. By then the residents of Bradford had already witnessed important contributions to cinema development, such as the invention of the Cieroscope in Manningham in 1896. The UNESCO City of Film designation recognises Bradford's aim to use this history and the local popularity and accessibility of film as a major tool for regeneration, cultural development and social inclusion. The residents of Bradford are represented in the British Parliament by Members of Parliament (MPs) for five separate parliamentary constituencies. Bradford East is represented by Imran Hussain (Labour), Bradford West is represented by Naz Shah (Labour), Bradford South is represented by Judith Cummins (Labour), Shipley is represented by Philip Davies (Conservative), and Keighley is represented by John Grogan (Labour). The city played an important part in the early history of the Labour Party. A mural on the back of the Priestley Centre For The Arts (visible from Leeds Road) commemorates the centenary of the founding of the Independent Labour Party in 1893. Bradford is within the Yorkshire and the Humber European constituency, which is represented by two UKIP, two Conservative, and two Labour MEPs. The voting figures for Bradford in the European Parliament election in June 2009 were: Conservative 24.7%, Labour 22.6%, UKIP 14.9%, Lib Dem 13.4%, BNP 9.4%, Green 8.8%. In 1974, City Of Bradford Metropolitan District Council was created to administer the newly formed metropolitan borough. The county borough of Bradford was merged with the Borough of Keighley, the Urban Districts of Baildon, Bingley, Cullingworth, Denholme, Ilkley, Shipley and Silsden, along with part of Queensbury and Shelf Urban District and part of Skipton Rural District by the Local Government Act 1972. 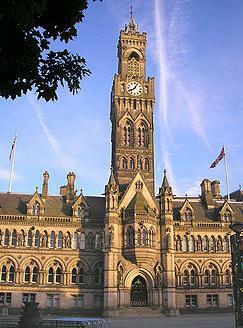 The Council, which is based at Bradford City Hall in Centenary Square, governs the whole metropolitan district. The city was granted the right on 18 September 1907 to elect a Lord Mayor. The city is divided into 30 Electoral Wards, each ward electing three Councillors. Elections are held in May, where one third of the 90 seats (one for each ward) are contested and the successful candidate is elected for a period of four years. The Metropolitan District is divided into 30 electoral wards. The coat of arms of Bradford City council is based on that of the former City and County Borough Council, with additions to indicate the merger of eleven Yorkshire councils. The boar's head, as in the former city council's crest, refers to the legend of the boar of Cliffe Wood. This was a ferocious wild boar that terrorised the populace and caused much damage to land and property; so much so that the Lord of the Manor offered a reward for anyone brave enough to slay the boar and bring its head to the Manor House. The mural crown is a frequent symbol of local government, but here also suggests a well head. The stag is derived from the device of the Denholme Urban District Council and the arms of the former Borough of Keighley, but represents the District as a whole. The white angora goat is retained from the former arms, recalling that the wool of this animal was used in the local industries. The roses on the collars refer to the Yorkshire rose and the compartment resembles the area's hills and dales. The original Bradford Coat of Arms had the Latin words 'LABOR OMNIA VINCIT' below it, meaning Work conquers all. Keighley and Worth Valley Railway, Ilkley's Cow and Calf Rocks, Bradford's National Science and Media Museum, Bradford City Park, Cartwright Hall, Saltaire village (a UNESCO World Heritage Site) and Salts Mill are key attractions that draw visitors from across the globe. Annual events such as the Bradford Literature Festival, Bradford Film Festival, Bradford Festival, Bradford Mela, Bingley Music Live, Ilkley Literature Festival, Haworth's 1940s weekend, Saltaire Festival and special Christmas events take place across the district. The value of tourism to the district's economy stands at more than £500 million a year, with an estimated 8.6 million day trips within the district. The impact of this is more than 13,500 jobs supported by the tourism and retail sector. The economy of Bradford is worth around £9.5 billion, contributing around 8.4% of the region's output, and making the district the third largest after Leeds and Sheffield in Yorkshire & Humber. Traditionally based on the wool and textile industries, manufacturing is still strong, accounting for around 1 in 5 jobs. The city's service-sector economy accounts for 77% of the district's 195,000 jobs, with today's fastest-growing sectors including information technology, financial services, tourism and retail headquarters and distribution. The district is home to a number of large businesses with recognised brands operating on a national and international scale such as Morrisons, Pace Plc and Hallmark Cards. Three of the UK's biggest financial institutions are based in Bradford: Yorkshire Building Society, Santander Group and Provident Financial. It is also home to nationally outstanding cultural businesses, a strong group of new media companies, and a significant national institution in the National Science and Media Museum. Tourism is worth over £400 million to the local economy, and employs over 10,000 people. Bradford's exports are worth almost £700 million. The city's working-age population has risen by 3.3% since 2000, faster than any UK city outside London, whilst the population of the city itself is growing by twice the national average. Bradford has a younger age profile than the Yorkshire & Humber regional average and the national average, with the younger age groups forming a greater proportion of the population in comparison. Bradford has been named by research group OMIS as one of the top six cities in the UK equipped for future growth, and the CBI reports that business confidence is higher in Bradford than in the UK as a whole, whilst £1.5 billion of construction work is transforming Bradford in a bid to attract further investment. At the 2001 UK census, Bradford had 326,774 residents aged 16 to 74. 2.5% of these people were students with jobs, 7.6% looking after home or family, 6.1% permanently sick or disabled and 4.5% economically inactive for other reasons. The City of Bradford has a lower economic activity rate than West Yorkshire, the regional average for Yorkshire and the Humber and the national average. Conversely Bradford has a higher economic inactivity rate than all these areas and also has a lower employment rate. Manufacturing is still strong in Bradford and accounts for almost 12% of all jobs, and the city's service-sector economy accounts for 82% of the district's 192,000 jobs. The entrepreneurial spirit is more present in Bradford than generally in the UK, with start-ups accounting for 12% of the business community. Bradford's GVA is over £6 billion. Education in the city is provided for by a number of schools and colleges. State schooling is managed by Bradford local education authority. There are also a number of independent (private) and free schools, such as Bradford Grammar School, Woodhouse Grove School and Bradford Girls Grammar School. Bradford College and the University of Bradford are the main further and higher education providers. Public transport in Bradford is co-ordinated by Metro. Most local train services are run by Northern, with longer-distance services to London King's Cross railway station served by Grand Central from Bradford Interchange and London North Eastern Railway from Bradford Forster Square station. The Wharfedale line connects direct to Ilkley, Ben Rhydding, Burley-in-Wharfedale, Menston, Guiseley, Baildon, Shipley and Frizinghall railway stations with Bradford Forster Square. The Airedale line connects the stations at Morecambe, Lancaster, Settle, Carlisle, Skipton, Steeton and Silsden, Keighley (change for the Brontë Country and the Worth Valley Railway), Crossflatts, Bingley, Saltaire (UNESCO World Heritage Site) and Shipley, continuing to either Frizinghall and Bradford Forster Square or to Leeds to the east of the district. Both Bradford Forster Square and the districts major and busiest railway station Bradford Interchange are served by the Leeds–Bradford lines with direct routes to Leeds, Selby and York. Bradford Interchange, via the Calder Valley line, also connects direct to stations at Manchester, Halifax, Rochdale, Burnley, Blackburn, Preston, Poulton-le-Fylde, Blackpool, Huddersfield, Wakefield, Doncaster and London. The M606, a spur off the M62 motorway, connects the district with the national motorway network. The M606 was originally laid out to reach the centre of Bradford and beyond, but connects instead to the A6177 Bradford outer ring road, making the motorway one of the shortest in the country at less than three miles (5 km) long. Another motorway was planned in the 1970s, envisaging a link between Bradford, the Aire valley in the north of the district and the M65 at Colne, roughly mirroring the existing A650 road. It has since been upgraded to dual carriageway along much of its length, bypassing the towns of Bingley and Keighley. The A658 road passes through a tunnel underneath the main Leeds Bradford Airport runway as it heads north-east from Bradford to Knaresborough. Leeds Bradford Airport itself is located in Yeadon, about 10 miles (16 km) to the north-east of the city centre, and has both charter and scheduled flights to destinations within Europe plus the United States, Egypt, Pakistan, and Turkey. There are connections to the rest of the world via London Heathrow Airport, Paris-Charles de Gaulle Airport and Amsterdam Airport Schiphol. ^ "The rise and fall of Wool City". Yorkshire Post. Retrieved 17 July 2010. ^ UK Census (2011). "Local Area Report – Bradford Local Authority (1946157124)". Nomis. Office for National Statistics. Retrieved 20 March 2018. ^ Foundation, Internet Memory. "[ARCHIVED CONTENT] UK Government Web Archive – The National Archives". Archived from the original on 17 December 2015. Retrieved 25 July 2016. ^ "2011 Census - Built-up areas". ONS. Retrieved 30 March 2019. ^ "Urban Audit – City Profiles: Leeds". Urban Audit. Archived from the original on 29 April 2009. Retrieved 29 January 2009. ^ "Bradford – the facts". Yorkshire Forward Government agency. Archived from the original on 1 July 2010. Retrieved 1 November 2010. ^ "Establishing Significance in Conservation Areas". English Heritage. Archived from the original on 1 August 2011. Retrieved 30 July 2011. ^ "Bradford and West Yorkshire – Around West Yorkshire – Against the odds?". BBC. Archived from the original on 3 October 2014. Retrieved 3 September 2013. ^ "Bradford and West Yorkshire – History – The Jewish connection!". BBC. 13 April 2006. Archived from the original on 23 April 2014. Retrieved 3 September 2013. ^ "ILP History: Beginnings in Bradford – ILP". Independentlabour.org.uk. 3 November 2011. Archived from the original on 28 March 2015. Retrieved 9 December 2013. ^ "Badges tribute to Pals and City fans who joined up and died together in World War One". Archived from the original on 4 March 2016. Retrieved 25 July 2016. ^ "6th Battalion, West Yorkshire Regiment (Prince of Wales's Own ) in The Great War 1914–1918". The Wartime Memories Project. Archived from the original on 2 November 2013. Retrieved 9 December 2013. ^ "Prince of Wales's Own (West Yorkshire Regiment)". Warpath.orbat.com. Archived from the original on 12 September 2003. Retrieved 9 December 2013. ^ "Bradford City of Film". Bradford City of Film. Archived from the original on 9 December 2013. Retrieved 9 December 2013. ^ "Widescreen Weekend". National Science and Media Museum. Retrieved 18 May 2018. ^ a b "Death of former head teacher Ray Honeyford sparks schooling debate". Telegraph & Argus. 11 February 2012. Archived from the original on 29 October 2013. Retrieved 26 October 2013. ^ "What happened to the book burners?". BBC News. 13 February 2009. Archived from the original on 19 February 2009. Retrieved 27 October 2013. ^ "Blueprint for 'divided' Bradford". BBC News. 12 July 2001. Archived from the original on 25 February 2007. Retrieved 27 October 2013. ^ "Saltaire World Heritage Site". Saltairevillage.info. 1 January 2004. Archived from the original on 4 December 2013. Retrieved 9 December 2013. ^ Meneaud, Marc (20 October 2007). "City tops green list". Bradford Telegraph & Argus. Archived from the original on 11 June 2013. Retrieved 24 October 2012. ^ the sustainablecities index (PDF). UK: Forum for the Future. 2007. Archived from the original (PDF) on 3 June 2013. Retrieved 15 December 2018. ^ Alison Benjamin; Martin Wainwright (20 October 2007). "And the winner of the award for the greenest city in Britain is ... Bradford". The Guardian. Archived from the original on 5 October 2014. Retrieved 24 October 2012. ^ "Bradford – greenest city". hippy shopper. Archived from the original on 30 December 2010. Retrieved 3 November 2010. ^ "UK National Commission for UNESCO :: Bradford, UNESCO City of Film". Unesco.org.uk. 30 September 2013. Archived from the original on 14 December 2013. Retrieved 9 December 2013. 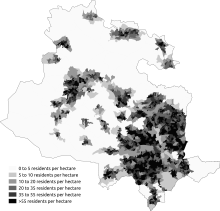 ^ "Key Figures for Physical Environment –Area: Bradford (Local Authority)". Neighbourhood Statistics. Office for National Statistics. Archived from the original on 13 June 2011. Retrieved 17 July 2010. ^ "bradford: city for peace/site12-14". Cityforpeace.org.uk. Archived from the original on 7 October 2011. Retrieved 17 July 2010. ^ Rogers, Simon (10 June 2009). "Eaxctly how well did the BNP do where you live?". Guardian: Data Blog. London. Archived from the original on 1 August 2013. Retrieved 14 July 2009. ^ "No. 28065". The London Gazette. 1 October 1907. pp. 6575–6575. ^ "Current political composition". City of Bradford Metropolitan District Council. Archived from the original on 20 September 2017. Retrieved 20 September 2017. ^ "Population Density, 2001 (UV02) – Area: Baildon (Ward)". Neighbourhood Statistics. Office for National Statistics. Archived from the original on 13 June 2011. Retrieved 17 July 2010. ^ "Population Density, 2001 (UV02) – Area: Bingley (Ward)". Neighbourhood Statistics. Office for National Statistics. Archived from the original on 13 June 2011. Retrieved 17 July 2010. ^ "Population Density, 2001 (UV02) – Area: Bingley Rural (Ward)". Neighbourhood Statistics. Office for National Statistics. Archived from the original on 4 June 2011. Retrieved 17 July 2010. ^ "Population Density, 2001 (UV02) – Area: Bolton and Undercliffe (Ward)". Neighbourhood Statistics. Office for National Statistics. Archived from the original on 13 June 2011. Retrieved 17 July 2010. ^ "Population Density, 2001 (UV02) – Area: Bowling and Barkerend (Ward)". Neighbourhood Statistics. Office for National Statistics. Archived from the original on 13 June 2011. Retrieved 17 July 2010. ^ "Population Density, 2001 (UV02) – Area: Bradford Moor (Ward)". Neighbourhood Statistics. Office for National Statistics. Archived from the original on 13 June 2011. Retrieved 17 July 2010. ^ "Population Density, 2001 (UV02) – Area: City (Ward)". Neighbourhood Statistics. Office for National Statistics. Archived from the original on 13 June 2011. Retrieved 17 July 2010. ^ "Population Density, 2001 (UV02) – Area: Clayton and Fairweather Green (Ward)". Neighbourhood Statistics. Office for National Statistics. Archived from the original on 13 June 2011. Retrieved 17 July 2010. ^ "Population Density, 2001 (UV02) – Area: Craven (Ward)". Neighbourhood Statistics. Office for National Statistics. Archived from the original on 13 June 2011. Retrieved 17 July 2010. ^ "Population Density, 2001 (UV02) – Area: Eccleshill (Ward)". Neighbourhood Statistics. Office for National Statistics. Archived from the original on 13 June 2011. Retrieved 17 July 2010. ^ "Population Density, 2001 (UV02) – Area: Great Horton (Ward)". Neighbourhood Statistics. Office for National Statistics. Archived from the original on 13 June 2011. Retrieved 17 July 2010. ^ "Population Density, 2001 (UV02) – Area: Heaton (Ward)". Neighbourhood Statistics. Office for National Statistics. Archived from the original on 13 June 2011. Retrieved 17 July 2010. ^ "Population Density, 2001 (UV02) – Area: Idle and Thackley (Ward)". Neighbourhood Statistics. Office for National Statistics. Archived from the original on 13 June 2011. Retrieved 17 July 2010. ^ "Population Density, 2001 (UV02) – Area: Ilkley (Ward)". Neighbourhood Statistics. Office for National Statistics. Archived from the original on 13 June 2011. Retrieved 17 July 2010. ^ "Population Density, 2001 (UV02) – Area: Keighley Central(Ward)". Neighbourhood Statistics. Office for National Statistics. Archived from the original on 13 June 2011. Retrieved 17 July 2010. ^ "Population Density, 2001 (UV02) – Area: Keighley East (Ward)". Neighbourhood Statistics. Office for National Statistics. Archived from the original on 13 June 2011. Retrieved 17 July 2010. ^ "Population Density, 2001 (UV02) – Area: Keighley West (Ward)". Neighbourhood Statistics. Office for National Statistics. Archived from the original on 13 June 2011. Retrieved 17 July 2010. ^ "Population Density, 2001 (UV02) – Area: Little Horton (Ward)". Neighbourhood Statistics. Office for National Statistics. Archived from the original on 13 June 2011. Retrieved 17 July 2010. ^ "Population Density, 2001 (UV02) – Area: Manningham (Ward)". Neighbourhood Statistics. Office for National Statistics. Archived from the original on 13 June 2011. Retrieved 17 July 2010. ^ "Population Density, 2001 (UV02) – Area: Queensbury (Ward)". Neighbourhood Statistics. Office for National Statistics. Archived from the original on 13 June 2011. Retrieved 17 July 2010. ^ "Population Density, 2001 (UV02) – Area: Royds (Ward)". Neighbourhood Statistics. Office for National Statistics. Archived from the original on 13 June 2011. Retrieved 17 July 2010. ^ "Population Density, 2001 (UV02) – Area: Shipley (Ward)". Neighbourhood Statistics. Office for National Statistics. Archived from the original on 13 June 2011. Retrieved 17 July 2010. ^ "Population Density, 2001 (UV02) – Area: Thornton and Allerton (Ward)". Neighbourhood Statistics. Office for National Statistics. Archived from the original on 13 June 2011. Retrieved 17 July 2010. ^ "Population Density, 2001 (UV02) – Area: Toller (Ward)". Neighbourhood Statistics. Office for National Statistics. Archived from the original on 13 June 2011. Retrieved 17 July 2010. ^ "Population Density, 2001 (UV02) – Area: Tong (Ward)". Neighbourhood Statistics. Office for National Statistics. Archived from the original on 13 June 2011. Retrieved 17 July 2010. ^ "Population Density, 2001 (UV02) – Area: Wharfedale (Ward)". Neighbourhood Statistics. Office for National Statistics. Archived from the original on 13 June 2011. Retrieved 17 July 2010. ^ "Population Density, 2001 (UV02) – Area: Wibsey (Ward)". Neighbourhood Statistics. Neighbourhood.statistics.gov.ukOffice for National Statistics. Archived from the original on 13 June 2011. Retrieved 17 July 2010. ^ "Population Density, 2001 (UV02) – Area: Windhill and Wrose (Ward)". Neighbourhood Statistics. Office for National Statistics. Archived from the original on 13 June 2011. Retrieved 17 July 2010. ^ "Population Density, 2001 (UV02) – Area: Worth Valley (Ward)". Neighbourhood Statistics. Office for National Statistics. Archived from the original on 13 June 2011. Retrieved 17 July 2010. ^ "Population Density, 2001 (UV02) – Area: Wyke (Ward)". Neighbourhood Statistics. Office for National Statistics. Archived from the original on 13 June 2011. Retrieved 17 July 2010. ^ "Civic Heraldry Of England And Wales – Yorkshire, West Riding (Obsolete)". Civicheraldry.co.uk. Archived from the original on 14 April 2010. Retrieved 17 July 2010. ^ a b "Civic Heraldry Of England And Wales – Yorkshire". Civicheraldry.co.uk. Archived from the original on 14 April 2010. Retrieved 17 July 2010. ^ "Download:output areas 2011 in Yorkshire and The Humber". NOMIS. Archived from the original on 3 September 2014. Retrieved 1 September 2014. ^ a b "Bradford Metropolitan District Council – Page Not Found". Archived from the original on 29 July 2013. Retrieved 25 July 2016. ^ a b "Census 2001 – Profiles – Bradford". Statistics.gov.uk. 13 February 2003. Archived from the original on 10 March 2010. Retrieved 17 July 2010. ^ "Bradford one of most deprived cities in region (From Bradford Telegraph and Argus)". Thetelegraphandargus.co.uk. 25 June 2009. Archived from the original on 29 June 2009. Retrieved 17 July 2010. ^ "Accent Community Partnerships, Bradford". Showcase.hcaacademy.co.uk. Archived from the original on 10 May 2017. Retrieved 17 July 2010. ^ "Bradford District" (PDF). Archived from the original (PDF) on 31 July 2009. Retrieved 17 July 2010. ^ "Bradford Crime Statistics & Policing | Local Crime Rates & Stats". UpMyStreet. Archived from the original on 17 June 2009. Retrieved 17 July 2010. ^ "Manchester Crime Statistics & Policing | Local Crime Rates & Stats". UpMyStreet. Archived from the original on 25 April 2009. Retrieved 31 August 2010. ^ "Bradford City of Film". Archived from the original on 8 July 2011. Retrieved 31 July 2011. ^ Mead, Helen (5 July 2011). "Why tourism is on the increase in the Bradford district". Telegraph & Argus. Archived from the original on 11 January 2012. Retrieved 14 September 2011. ^ a b c d e "Bradford: the facts and figures". Yorkshire Forward. Archived from the original on 1 July 2010. Retrieved 17 July 2010. ^ "Census 2001 – Profiles – Bradford". Statistics.gov.uk. 13 February 2003. Archived from the original on 10 March 2010. Retrieved 17 July 2010. ^ "Assessment" (PDF). Archived from the original (PDF) on 15 June 2011. Retrieved 17 July 2010. ^ Bradford Metropolitan District Council. "Bradford Metropolitan District Council | Twin Towns and Villages | Twin Towns and Villages Overview". Bradford.gov.uk. Archived from the original on 28 June 2009. Retrieved 17 July 2010. Wikisource has the text of a 1911 Encyclopædia Britannica article about Bradford.